The University of Reading offers hundreds of different societies, one of the fastest growing is the History Society. Over the past two years, the society has gone from 12 members, to over 45, and we plan to keep the trend going! So far, the society has run two successful trips abroad; Berlin and Prague. These trips were a fantastic opportunity for members to build great friendships, and create memories that would last a lifetime. This year, the committee have already started chats with ILoveTour about a trip to Budapest. Our plan is to take 40-45 of our wonderful members away to one of the most upcoming cities in Hungary. However, the society is not just about our trips abroad…throughout the year we are going to offer you so many different socials and events to make your year even better. 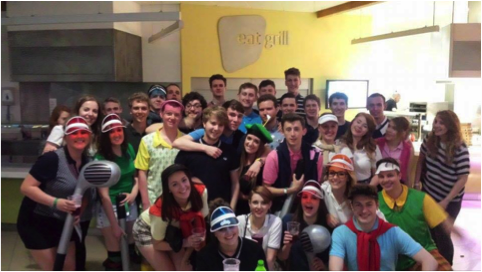 Last year we had a “12 bars of Christmas” pub crawl, pub golf and several evenings in London Road and Park Bar. I must say, the fancy dress was exceptional (so, no pressure for this year). We have already got several nights out planned for you guys, and we are expecting the outfits to be even better – and trust me, you learn how to do fancy dress for free. “Yeah, we get it, we’ve got nights out…but what else?” Well! This year we have already started making plans to take a coach load of people to Hampton Court, and we are making day plans for the museums in London. We have got the History Resources Room (Humms 142), for students – (so make sure you guys use it!) but we can plan some movie nights and more casual evenings in there as well! This year, we are making a real push to have the society and the academic staff communicating with each other. You guys are going to know well in advance about all the events the staff are putting on, such as specialist lectures (check out the rest of the blog to see some of last year’s events!). Our main aim for this year is to have as many students involved in the society as is humanly possible – even if your flat mates don’t do history, bring them along! RU Making History has always offered a friendly atmosphere in which everyone is accepted and made to feel welcome, and we know we can maintain this and make it even better. History Society made a lot of people universities experience, so I cannot wait to meet even more people to become members! This entry was posted in The History Society and tagged adventure, discovery, fun, history society, new friends, Reading, travel. Bookmark the permalink.